CAPE CANAVERAL, Florida -- The Sun's very Active Region 1515 has now spit out 12 M-class flares since July 3. 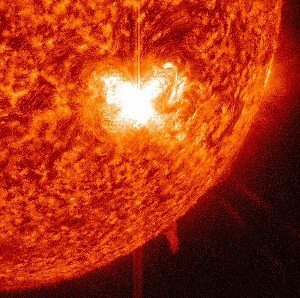 Early in the morning of July 5, 2012 there was an M6.1 flare. It peaked at 7:44 AM EDT. NASA says that this caused a moderate – classified as R2 on the National Oceanic and Atmospheric Administration's space weather scale – radio blackout that has since subsided. Radio blackouts occur when the X-rays or extreme UV light from a flare disturb the layer of Earth's atmosphere known as the ionosphere, through which radio waves travel. The constant changes in the ionosphere change the paths of the radio waves as they move, thus degrading the information they carry. This affects both high and low frequency radio waves alike. Radio blackouts are rated on a scale from R1 (minor) to R5 (extreme). An R2 radio blackout can result in limited degradation of both high- and low-frequency radio communication and GPS signals. The same region has also produced numerous coronal mass ejections or CMEs. They have been observed and modeled by NASA's Space Weather Center (SWC) and are thought to be moving relatively slowly, traveling between 300 and 600 miles per second. Since the active region itself is so southerly in the sun, CMEs from this region are generally unlikely to impact Earth. The strongest flares are classified as X-class, while M-class flares are the second strongest classification. Classified as an M6.1, this latest flare is a little over half the size of the weakest X-class flares.